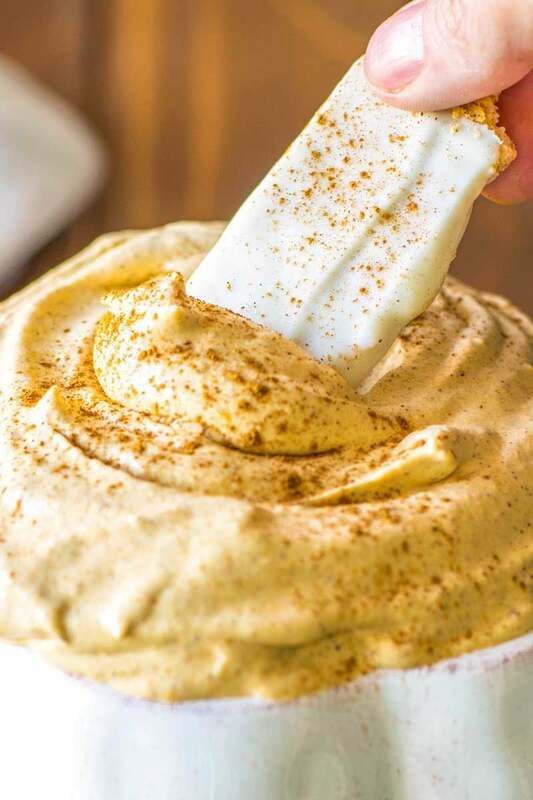 This easy and creamy pumpkin dip is the best way to cure a crowd's cravings for fall comfort food. Plus, there are white chocolate graham crackers for dipping! I’m one of those people who spend most of the summer looking forward to the “pumpkin everything” season, because, well… I simply love everything pumpkin. 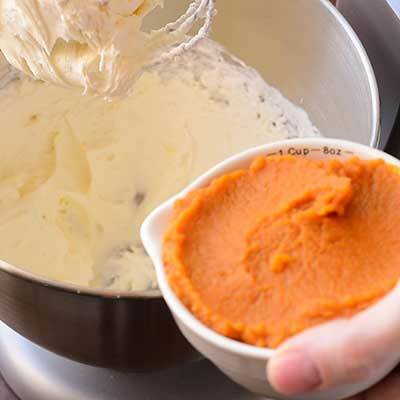 And if you’re here searching for creamy pumpkin cheesecake dip, I’m going to bet you’re in the same boat, too. Because what better way is there to enjoy this fall classic than with a party dip you can share with your other fall-loving friends? 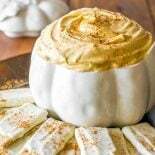 What to serve with pumpkin dip? Instead of just telling you to “go buy some cookies to dunk in this dip,” this recipe includes a super easy way to dress up the standard dessert dipping fare: white chocolate covered graham crackers. It’s the perfect way to give this dip a homey, rustic feel and to kick up the flavor of sweet to indulgent. 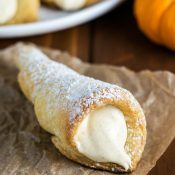 I chose to go with white chocolate because I think it compliments the subtle flavors of the pumpkin best, but you can also opt to dress your graham crackers in milk chocolate instead. Both will be equally amazing, so go with whatever your heart desires most! However, all that being said, I totally understand if you’d rather use a store-bought (and easier!) dipping choice for this pumpkin dip. Sometimes time, effort, and overall motivation are in short supply, especially when you’re making plans for a group. And if you ask me, you’re already doing your part by whipping up the dip in the first place. High five for putting in the effort! So, if you’re on the hunt for an easy way to round out this dip, here are some of my best suggestions. Feel free to try one (or as many) as you like! This list could go on and on. If you find a new combination for dipping, I’d love to hear about it in the comments! How long can you leave out a dessert dip? For most foods, the general rule of thumb is that a perishable item should not be in the “danger zone” for more than two hours. And by “danger zone”, this is usually at or just above room temperature, which is typically how this dip will be served. As the party goes on, you can move your dip back to the refrigerator once you get past the two-hour mark. If your guests still want more dip, let it chill for at least 30 minutes before bringing it back out again. 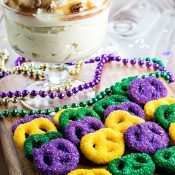 One of the most common questions I get about dessert dips is whether or not you can make them in advance. I totally understand why someone would want to do this, as it’s easier to prepare treats for a party the night before than scrambling to get everything done the day of the event. The good news is that the answer to this question is almost always yes. 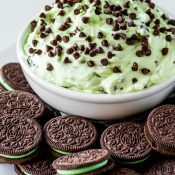 BUT, each dip has its own considerations depending on the ingredients. 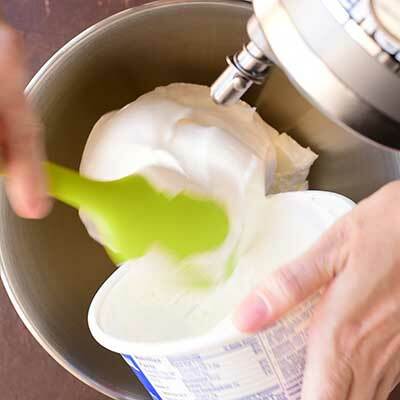 For this cheesecake dip, the ingredients you want to be careful of are the cream cheese and the cool whip. 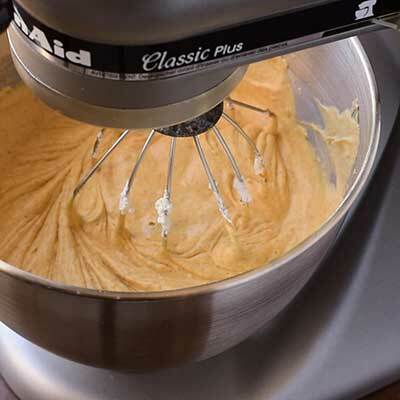 For this recipe, I highly recommend using a stand mixer or a hand mixer. 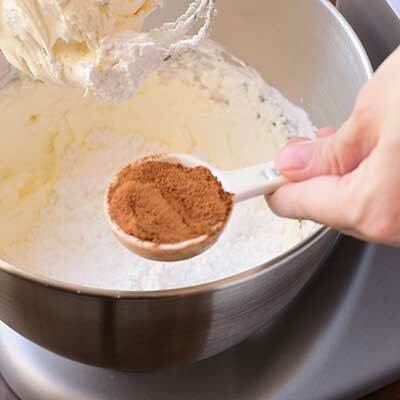 This isn’t a recipe you can make by hand with a whisk. If you liked the serving bowl in these photos, I picked it up at Pier 1 Imports a few years ago. I haven’t been able to find it online recently, but this clear pumpkin jar has a similar look. And this orange pumpkin jar is cute, too! If you’re making the white chocolate graham crackers for dipping, I highly recommend using Ghirardelli brand white candy melts. Wilton may be popular and easier to find, but the consistency and quality of Ghirardelli just can’t be beat. Want the dip to be more firm? No problem! Once the dip is mixed, just place it in the refrigerator for 30 minutes or so, then serve. 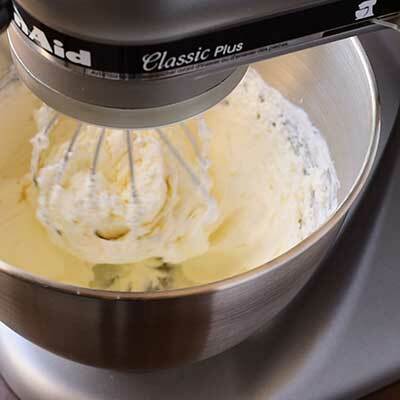 Step 1 – Using a stand mixer (or hand mixer + large bowl), add cream cheese and cool whip. Whip them together on medium-high speed until ultra creamy. 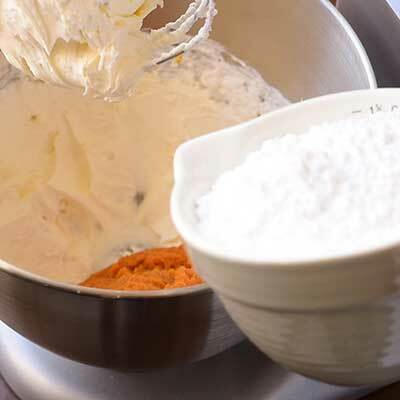 Step 2 – Pause your mixer and add in the pumpkin puree, powdered sugar, pumpkin pie spice, and vanilla extract. 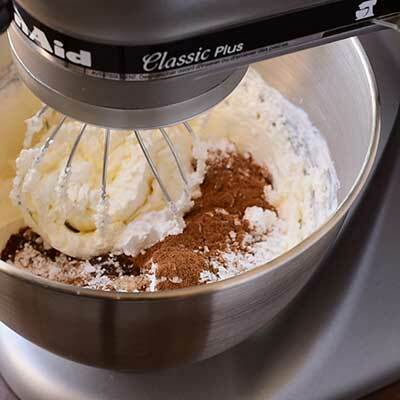 Once everything is in, turn on your mixer and whip until it’s nice and creamy! Step 3 – Serve and enjoy! 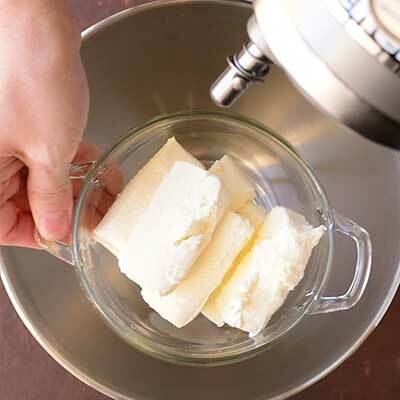 Place white chocolate candy melts in a microwave safe bowl. Heat candy melts in the microwave per package instructions, stirring 20-30 seconds after each time heated. Holding one end of the graham cracker, dip the bottom into the melted white chocolate. 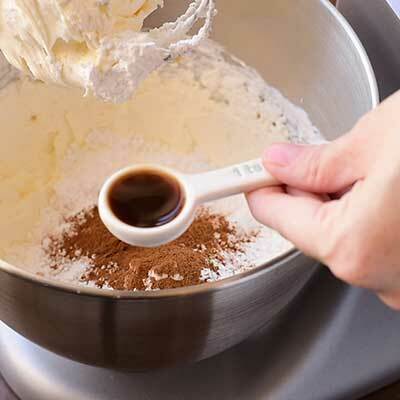 Use a spatula to gently tap the white chocolate along the sides until the graham cracker is sufficiently covered. 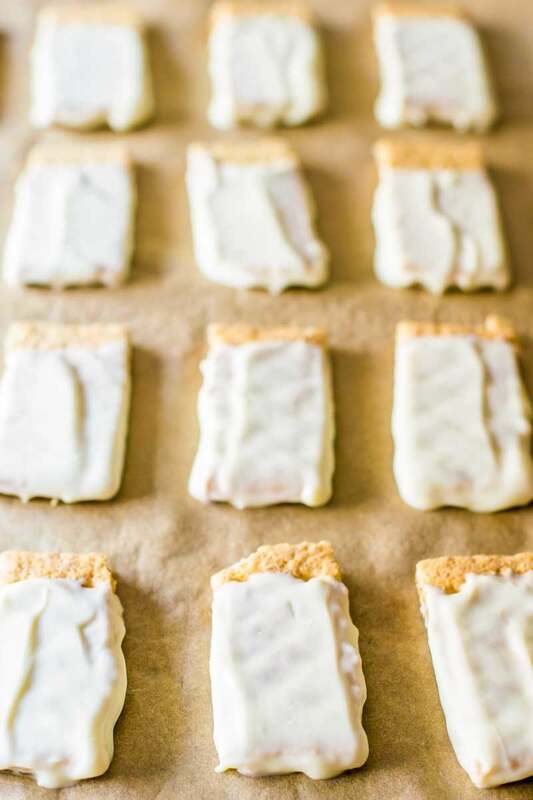 Lift the graham cracker out of the white chocolate and use the spatula to slide down the flat sides of the graham cracker, smoothing the candy coating and removing any excess. Give the graham cracker a quick, final shake, then place on parchment paper to dry. 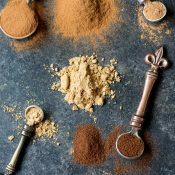 Sprinkle tops of graham crackers with ground cinnamon (optional). Repeat this step until all graham crackers are coated. Let graham crackers dry for at least 30 minutes before serving. 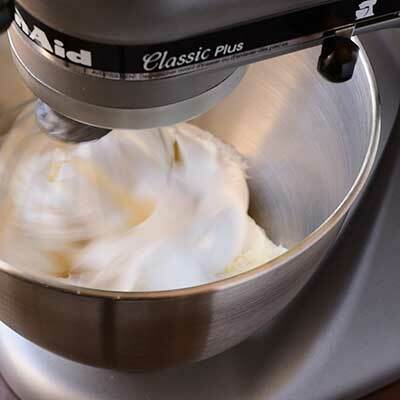 Using a stand mixer (or a hand mixer + large bowl), add in cream cheese and cool whip and beat on medium until smooth and there are no clumps, about 2 minutes. 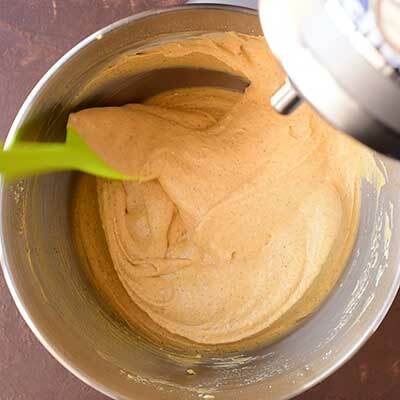 Keeping speed on medium, mix in pumpkin puree, powdered sugar, pumpkin pie spice, and vanilla extract until combined. 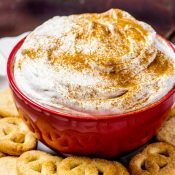 Place dip in a serving bowl and sprinkle top with ground cinnamon (optional). If desired, place dip in the refrigerator for 30 minutes - 1 hour to firm up more. If making dip in advance, keep dip refrigerated until ready to serve and allow 30 minutes - 1 hour for dip to soften again before serving. Love it! Such a great idea and so creative! 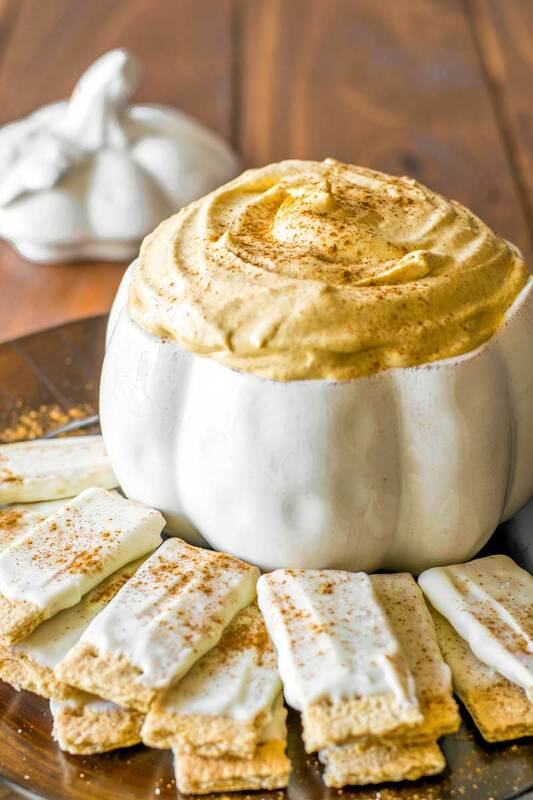 This pumpkin cheesecake dip is perfect any fall party! pinned! This sounds amazing! I am going to need to try it! This is pure heaven! It’s only 7:30am and I want this for breakfast!! Mmmm, the cheesecake dip sounds delightful. I think I’d personally skip the white chocolate though, just a wee bit too much sweet all in one. What a lovely dip for a Halloween party! 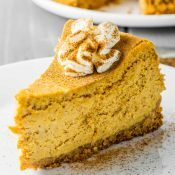 Anything pumpkin + cheesecake is a winner in my book! This sounds perfect for a fall get together! What a great idea for the upcoming holiday parties. So creative and so unique! I 100% support you on the non-Wilton chips — those are pretty much the worst things you can get. Even regular old white chocolate chips would work better, but higher quality chocolate like Ghirardelli, Callebaut, or even Lindt will make such a huge diff in taste and texture. This dip looks amazing, as I knew it would! And I’m glad you’re on the pumpkin train with me! No shame. Looks yummy! Great article and great blog! Found you on FB GYB group. Let me know if you’d like to collaborate on anything in the future to grow together. My site is http://www.4hourbodygirl.com. This sounds awesome! And I love the idea of the white chocolate graham crackers. Yum! 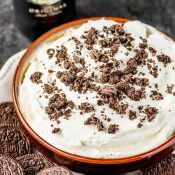 This cheesecake dip recipe looks amazing and something I would love! I can’t wait to try it! Thank you for sharing! This sounds dangerously delicious! I like it 😉 Also, I’m a huge pumpkin spice fan so I have no problem with you keepin’ the pumpkin recipes coming! I don’t hate pumpkin but I do hate seeing it screamed from the rooftops in August. I mean…it’s a squash for crying out loud! Now apples…those I get. This sounds divine and yet my biggest takeaway? I’m heading to Pier One stat…love that dish! This cheesecake dip is evil! Why did you have to do this to me ? Major midnight cravings over here. 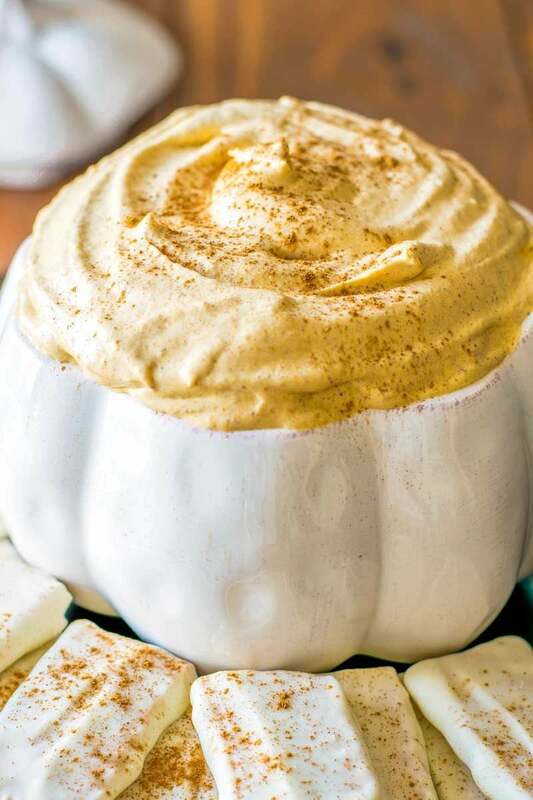 This will definitely appease my pumpkin cravings….until this is all gone and I want more of it! Yum! What a great fall party dip! This looks amazing!! How long will it keep in the fridge? Hey Amy! The dip should store in the fridge for up to 5 days in a sealed container. I’ve got this pumpkin puree in my freezer leftover from a slow cooker pumpkin puree I posted. 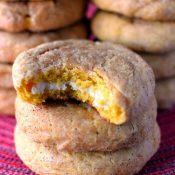 I feel like I’ve made so many pumpkin recipes lately, I’m afraid my reader will begin to hate me! I love this dip though! I think I’ll use some of my leftover puree to make it and bring it to Thanksgiving. Sound like an awesome recipe! I made this last year for a get together. It was so good. I definitely will make this again! This came out very good! I found it to be greatly improved by just a pinch of salt though. Taking it to a Halloween party today!